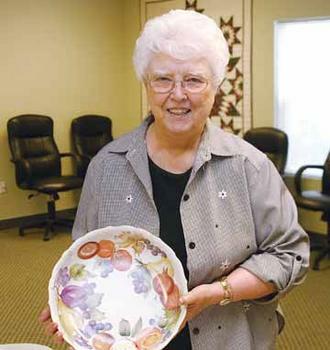 Showing off her hand-painted porcelain bowl at the Senior Wellness Symposium and Art Exhibit is CherryWood resident Fedalma Ruhl. She has lived there five years. It was a day dedicated to health and happiness for our older citizens, May 24th at CherryWood Village. Baker said the facility provides this event to the community ‚Äì as well as to their residents ‚Äì to promote senior health and wellness. And they hold it on this particular date, because it’s National Senior and Health and Fitness Day. 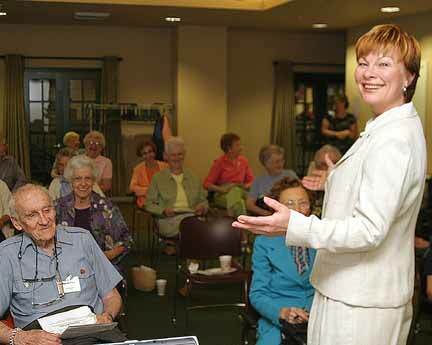 Sherrie Evenson, Adventist Medical Center, tells CherryWood Village seniors how physical exercise can keep their minds sharp. We stopped in to listen to a lecture by Sherrie Evenson, of Adventist Medical Center. “We’re talking about the relationship between exercise and dementia in older people.